The province of Ferrara (Italian: provincia di Ferrara) is a province in the Emilia-Romagna region in Northeast Italy, on the Adriatic Sea. Its capital is the city of Ferrara. 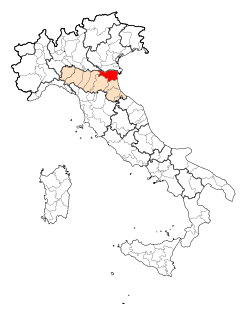 The province of Ferrara is the most northerly province in the Emilia-Romagna region. It has an area of 2,635.12 km2 (1,017 sq mi). The provincial capital, the city of Ferrara, is on a branch of the Po river and at about 50 km (31 mi) northeast of Bologna, the capital of the region. The province is bordered to the north by the province of Rovigo in the Veneto region, to the northwest by the province of Mantua in Lombardy, to the west by the Modena and Bologna provinces, to the south by the province of Ravenna and to the east by the Adriatic Sea. The province is completely flat, with an altitude that goes from 0 m to less than 100 m (328 ft) high in the west of the province, on the border with the Modena province. Most comuni have less of 10 m (33 ft) of average altitude; the comune with a higher average altitude is Sant'Agostino. The main rivers in the province are the Po and the Reno. The Po forms the north border of the province with the province of Rovigo. In Ferrara, the river has three main branches: the Po di Volano, that flows through the city of Ferrara, the Po di Primaro and the Po di Goro. The Reno river is the longest of the region without being a tributary of the Po. The main lakes in the province are the Lago delle Nazioni ("Nation's Lake), an artificial lake, and the Lago del Quaternario. There are 348,362 persons living in the province (January 2017), for a population density of 132.2 inhabitants/km². The following shows the 23 comuni (municipalities) with the population, and the area and altitude. Wikimedia Commons has media related to Province of Ferrara. ↑ "Presidente" (in Italian). Provincia di Ferrara. Retrieved 31 August 2016. ↑ 2.0 2.1 "Provincia di Ferrara" (in Italian). Tuttitalia.it. Retrieved 31 August 2016. ↑ "Comuni Provincia di Ferrara per popolazione" (in Italian). Tuttitalia.it. Retrieved 5 November 2017. This page was last changed on 3 December 2017, at 05:37.